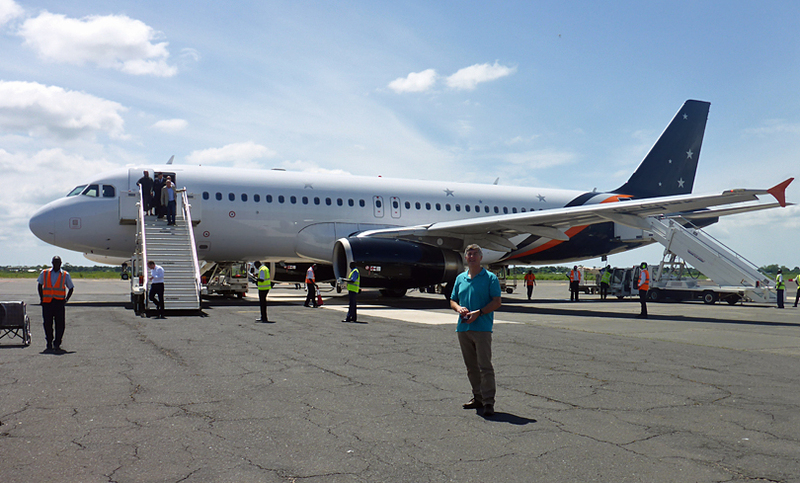 An update from Gambia Experience's MD about the New Titan flights to The Gambia. In October each year I go out to The Gambia with Karen Durham, our Gambia product manager, to visit our hotels, talk with our staff and other people about the forthcoming season. It’s a good opportunity to see what improvements have been made and how work is progressing before the main season starts. And I have to say that the hotels are looking great and ready to welcome our guests this winter... and the sun is shining! Another major reason for our visit at this time was to experience the launch of our first Titan Airways flights from Gatwick and we weren’t disappointed. I confess that I love Titan – we operate a summer programme to Corsica and have used them for the past 6 years for some of our flights to the island. From the word go the feedback we received has been the best of any airline we have worked with. For years I’ve been wanting to use them for our flights to The Gambia, but frankly they have been too expensive (excellence does cost money). However, with the new efficient Airbus A320s coming into their fleet, and world oil prices dropping, we have now been able to make this work. We’ve spent the Summer months working with Titan to specify what we believe is required to provide the best flights to The Gambia – choosing seats, deciding on legroom, tasting catering, working through on-board branding and entertainment – using our 28 years of experience of flying to The Gambia to fine tune this important part of a holiday. And what a joy – there are less seats on the aircraft – and the seats are brand new (we got to test the seats before they were ordered) – meaning that throughout the aircraft the legroom is greater than any other charter flight to The Gambia (past or present). 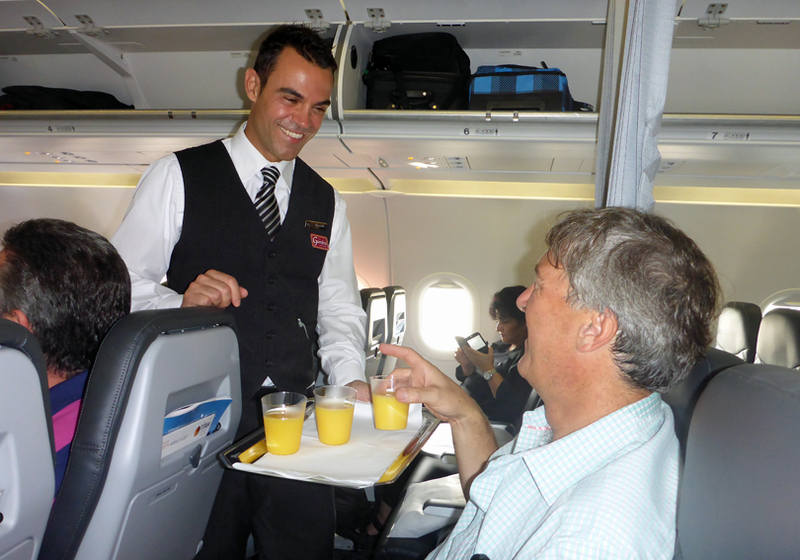 Catering is improved, and still includes a late tea/coffee and biscuit service as well as the main meal – plus there is a selection of complimentary soft drinks throughout the flight. The crew are a real asset – professional and attentive, but also friendly and approachable. Entertainment is ‘state of the art’. There are no screens, instead you use your tablet or phone to watch a good range of films, TV or listen to music through an on board WiFi system. You will need to download Titan’s App before you fly. Just search for ’Titan Inflight’ in the appropriate App store for your device, be it an iPad, iPhone, Android or Kindle. And for something even more special we have our new Star Service. Up to 36 seats in the front cabin, 2 seats abreast with a table between. All drinks are complimentary (except champagne) and the food is stunning (as pictured below). iPads (with noise reduction headphones) are supplied so you can choose your own film to watch when you like. A constant supply of drinks, hot towels and food, together with the entertainment means the flight literally does fly by. The sense of service is exquisite – there are no trolleys used – each drink, each meal is individually served from the galley to the passenger – flying as it used to be. 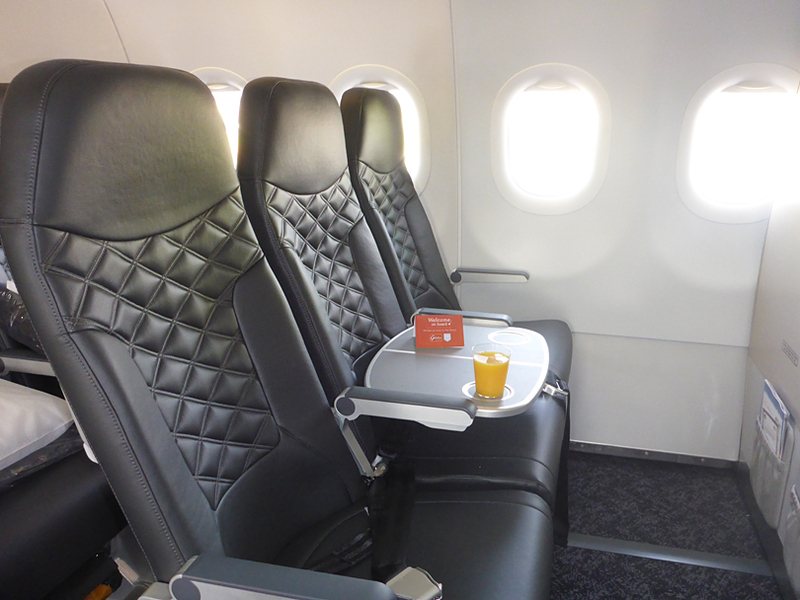 "Excellent flight, good seats and legroom, good attention from staff. Excellent food – one of the best in-flight meals for a long time! Brilliant. Extremely courteous staff. Didn’t seem like a charter at all. I really enjoyed flying with Titan. 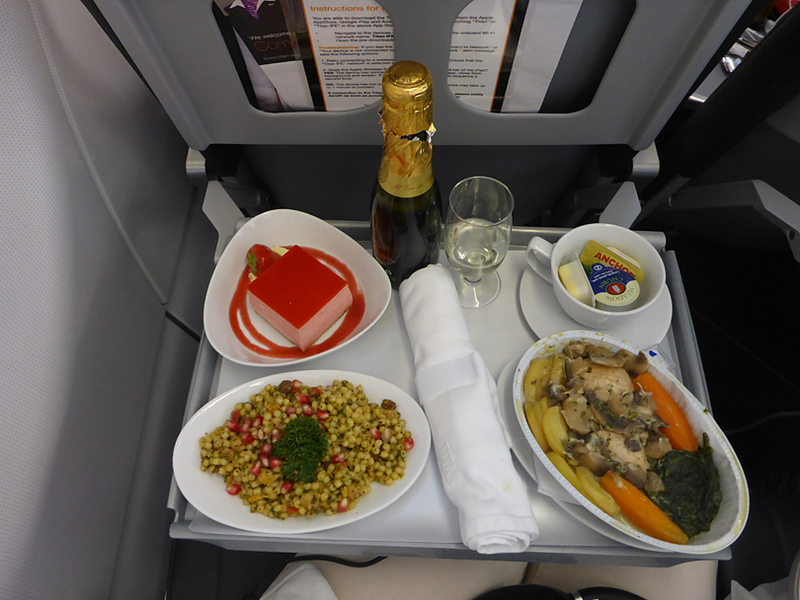 The best flight meal I ever had; it was well presented and very delicious. I will definitely be flying with Titan from now on." "The crew were first class. The service was first class. The food was first class. First Class package at economy price – can’t be bad. Thank you Gambia Experience and Titan. Was disappointed with no in-flight entertainment but I understand it was teething problems and look forward to It on our flight back. Despite the above we had a welcoming, comfortable flight. I look forward to flying with Titan again. Excellent meal and quality service and genuine customer attention. The best ever for the several years I have travelled with Gambia Experience." "I have been coming to the Gambia twice a year for the past 16 years. I have to say my return trip last Friday was the best ever. The plane had all new seating .Very smart indeed. The crew were second to none. They were so helpful nothing was too much bother. I was in economy class, and was treated extremely well. Great flight, great amount of legroom. Crew very helpful. Good food, the best we have ever had on a flight. Thank you for a pleasurable time on board." "Would fly again with Titan definitely. The airline crew are very pleasant, professional, smartly dressed, helpful, polite and a credit to the airline. Service standard during the flight was 10/10. I would recommend anyone to come and fly with Titan to feel how I felt during the whole flight to Gambia. I appreciated that the flight was fairly new, clean and it was comfy all the way. The cabin crew were second to none, bravo!!" I have flown over 50 times to Gambia since 2003 and I can quite clearly state that Tuesday’s flight with your new carrier Titan was the best of all by a country mile for the following reasons. 1. punctual. 2. clean, new, up to date aircraft. 3. smart, experienced, quality crew that were attentive, professional and slick. 4. in-flight entertainment. 5. quality meal. 6. top pilot (as judged by perfect landing and the made up time)." I know there can be cheaper ways to get to The Gambia, and indeed I could have chosen to contract a ‘cheap & cheerful’ airline that would get you to your destination, but for me, especially with a 6 hour flight, this is a crucial part of the holiday experience. I believe holidays should start when you leave Gatwick – rather than enduring a flight and then recovering in your hotel, always mindful of what awaits on the journey home.